Baymax: We jumped out of a wiiiiiiindooooow. Fred: If I could have any superpower right now, it would be to be able to go through that phone and give you a big hug. Baymax: Fist bump is not in my database. Hiro: This isn't a fighting thing. It' what people do sometimes when they are excited or pumped up. Baymax: [Waving fingers in air] Bah-a-la-la-la! Wasabi: I spill wasabi on my shirt one time...! Hiro: [meeting Tadashi's friends] Honey Lemon? GoGo? Wasabi? Wasabi: [frustrated] I spilled wasabi on my shirt ONE TIME! Tadashi: Fred comes up with the nicknames. Fred: I've been churning at Honey to develop a formula that can turn me into a fire-breathing lizard at will. But she says that's not science. Fred: Yeah. And I guess the shrink ray I asked Wasabi for isn't science either, is it? Fred: Well then, what about invisible sandwich? Imagine eating a sandwich but everyone just thinks you're crazy. GoGo: My brain hates my eyes for seeing that. GoGo: There are no red lights during car chases! Hiro: I don't wanna lose you too. GoGo: A lunatic in a mask... just tried to KILL us. Fred: How cool is that?! I mean, it's scary, obviously, but how cool! Baymax: [upon fist-bumping] : Balalalala. GoGo: [meeting Hiro] Welcome to the nerd lab. GoGo: Zero resistance, faster bike. GoGo: But not fast enough. 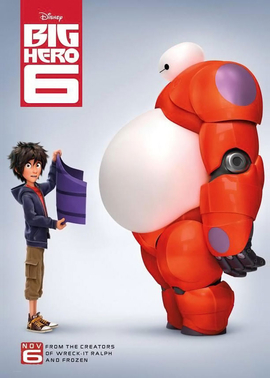 Hiro: [surprised] Uh, Bay... Bay-Baymax, I didn't know you were still... active. Hiro: No, no, no, that's okay. No touching. Tadashi: [pauses] You're going bot fighting, aren't you? Hiro: There's a fight across town! If I book, I can still make it! Hiro: What? Go to college like you so people can tell me stuff I already know?